VAUGONDY - III. 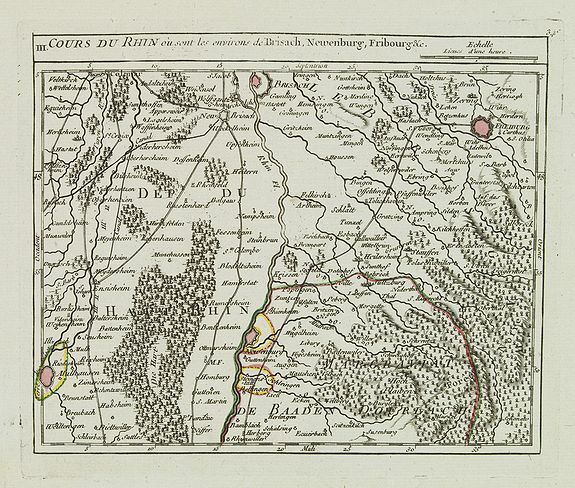 Cours du Rhin où sont les environs de Brisach, Newenburg, Fribourg &c.
VAUGONDY, R. de - III. Cours du Rhin où sont les environs de Brisach, Newenburg, Fribourg &c.
Title : III. Cours du Rhin où sont les environs de Brisach, Newenburg, Fribourg &c.. Size : 6.4 x 7.8 inches. / 16.3 x 19.8 cm. Description :Small detailed map illustrating the stretch of the Rhine which flows between Nuremburg and Breisach am Rhein. Page 34c outside border top right. Mary Sponberg Pedley does not mention a state without date.